A now established best seller, the slatbox display really does have to be seen to be believed. They may look small and fragile but slatboxes are anything but. Whilst no published weight bearing guideline is available, they hold an incredible weight for their size. 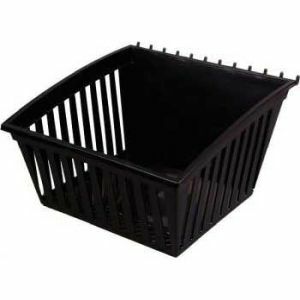 Popular with fishing tackle shops to hold lead weights and builders merchants for carrying plumbing and heating supplies, we feel the slatbox will surprise. Designed for slatwall panels, they also have an attachment that enables use in pegboard back displays. We estimate a minimum holding of 20kg from our smallest box and they fit easily and directly into the panel itself. 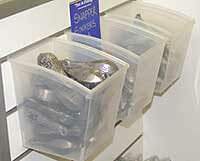 The convenient slatwall display and fittings are also handy for supermarkets and hardware centres. 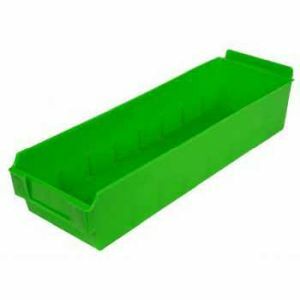 These new holders are made from food grade polypropylene making them suitable for food contact, and are highly resistant to colour fade making them overall, a super and cost effective shop solution.